FindMyPast - the British genealogy website, is expanding to America. They currently have a deeply discounted World Subscription rate, and since my Ancestry subscription is US-only, I decided to give it a try. 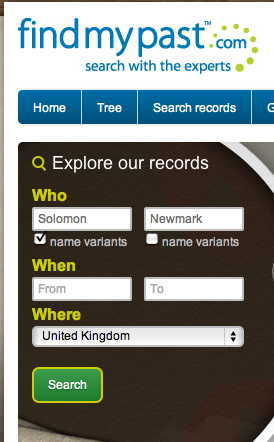 My first search involved the brother of my great grandfather, Sol Newmark. 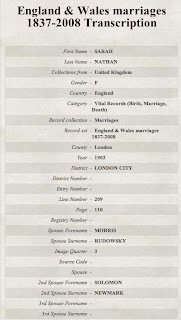 I knew he had gotten married in London. 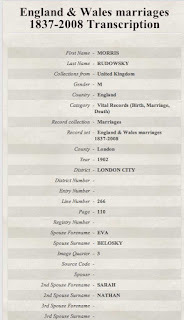 I actually already have a copy of his marriage certificate, but I was curious what FindMyPast would turn up. 1) On the opening screen I entered his name under Who. I selected 'name variants' for the given name, but not the surname. 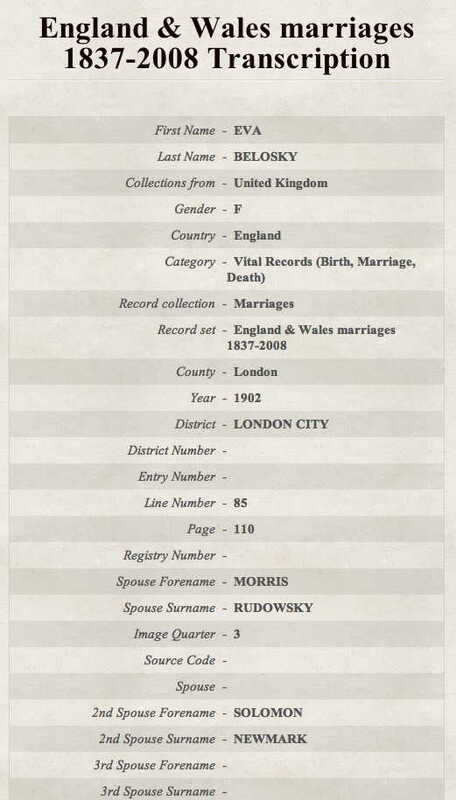 B) What we have here is a page of a document with multiple marriages and the FindMyPast transcribers were unable to differentiate the marriages for some reason, so they include all of the surnames. If you enlarge the images, you will notice that all four indicate a Page # of 110. They all have the same "Image Quarter" (3). I was unable to fit the entire transcription in the images, but there is also a row that indicates they all have identical Volume #s (1C) All other rows with data in them are in the images above. I decided I wanted to view the image of Page 110. So from Solomon's transcription I clicked on the View Image button. Above I show the top of the page, so you can see the header, and the bottom of the page where Solomon's entry was located (in the middle column). You can see that isn't page 110. The images for Sarah Nathan, Eva Belosky, and Morris Rudowsky are all on different pages. It's clear why the transcribers didn't know which spouse was which. They entered the volume and page number for each person, and then saw who matched up. I believe '3rd Quarter' represents the months of the year - since each year appears to have been divided into 3-month segments. The image doesn't really contain any information that isn't on the transcription. This is all supposition. 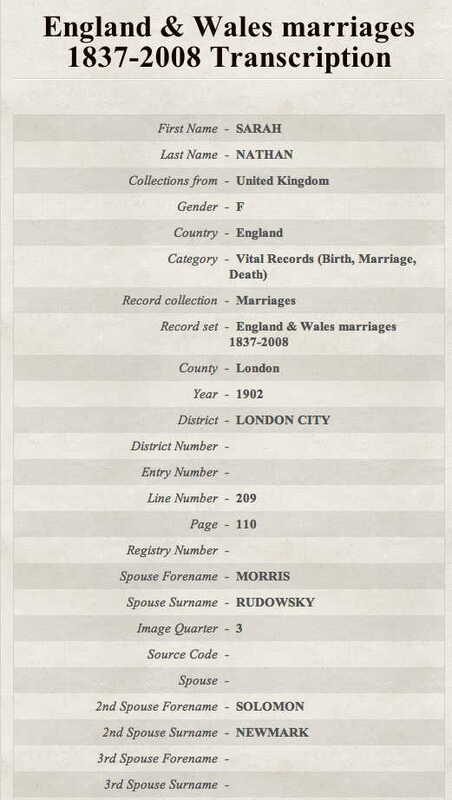 I could probably do some research on the England and Wales Marriages (1837-2008) database - but this information isn't on the FindMyPast website that I could tell. I'd have to find it on a different website with the same database. They also provide no information on how to take this information and order the actual certificate - which would be nice. 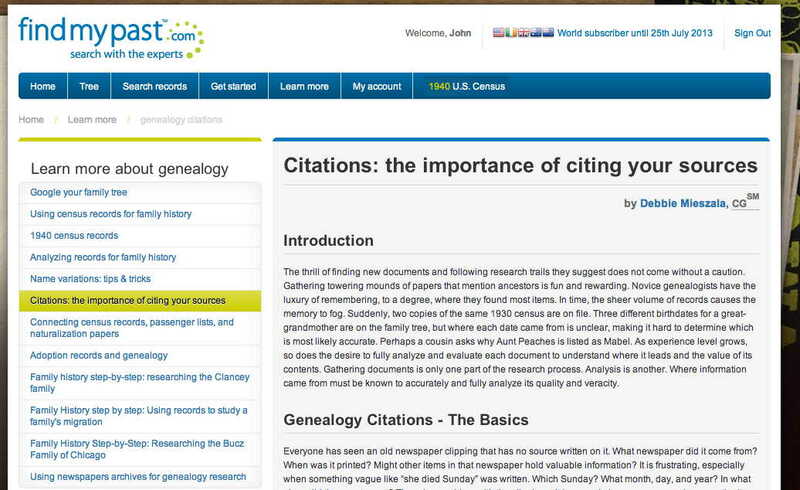 As Randy at Genea-Musings noted there isn't enough information for a proper citation. If I don't care about the academic quality of the citation (which in general I don't) I have enough information to suffice for my own needs. FindMyPast does have an article in their "Learn More" section on the importance of citations. 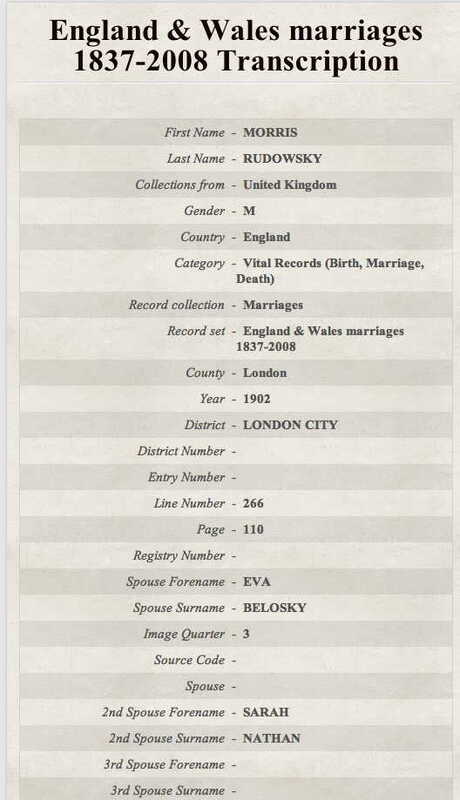 Note: As Randy points out in the comments, FreeBMD does have the information about these records that FindMyPast doesn't. 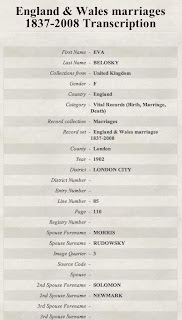 I'm unsure where I retrieved the Volume and Page # for my great great uncle back in 2007 (no source notes were written down in my database), but wherever it was, they didn't provide me with multiple spouses. They probably just provided me with the volume and page number for Solomon, which was enough for me to order the certificate from the General Register Office. While the multiple spouses listed might not confuse British researchers, now that they are trying to attract American researchers, it would likely behoove them to provide a little bit of explanation. 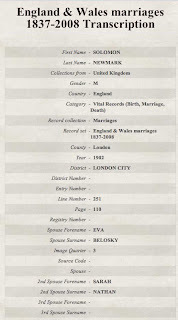 Further Note: Here's the Certificate ordering information that FindMyPast provides on their British website. They haven't yet moved it over to their American site. The British may be expected to know this, but now that they've opened it up to Americans, they should have an explanatory notice. I don't remember exactly where I found the Volume and Page # originally -back in 2007 -for my great-great-uncle before ordering the certificate from the GRO. I know I didn't know my great-great-aunt's maiden name beforehand. 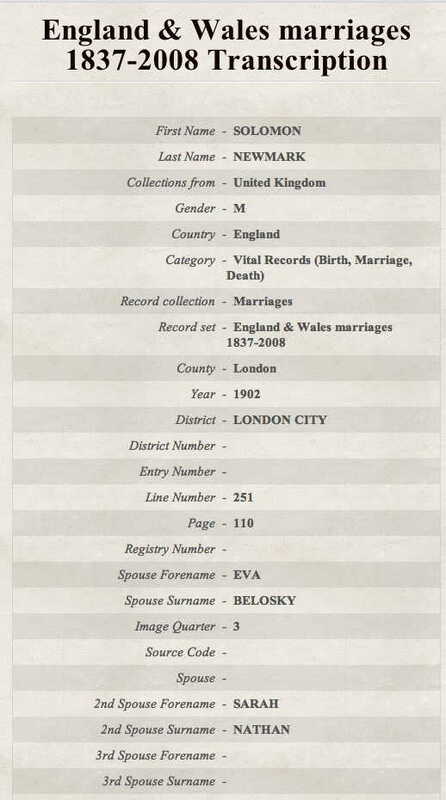 I believe whether it was FreeBMD or the National Archives, they didn't provide me with both spouse's names - they just provided me with the volume and page number for Solomon - which was enough to order the document.